"Do you want to kiss me?" 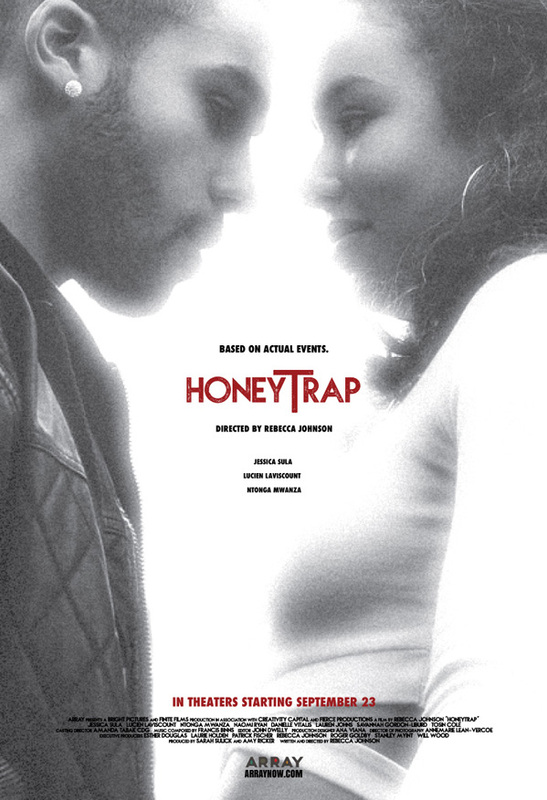 Array has debuted a new official trailer for an indie drama called Honeytrap, which premiered at the London Film Festival back in 2014 and is finally getting released in US theaters this year thanks to Ava DuVernay's new distribution company. The film stars Jessica Sula as a 15-year-old girl in high school in the UK who, after a bullying incident, decides to "transform herself inside and out." She then gets caught up in various romances with older men. Also starring Lucien Laviscount, Naomi Ryan, and Ntonga Mwanza. This looks like a unique coming-of-age drama with some strong performances, but not sure if it's worth checking out in theaters or not. The music they use in this trailer is lovely. Take a look. Girlhood and gang culture collide in Rebecca Johnson's Honeytrap as 15-year old Layla (Jessica Sula) contends with bullying at a new school by transforming herself inside and out. The teen's compulsive journey for love and acceptance soon becomes fatal in this cautionary tale based on headline news. Honeytrap is both written and directed by filmmaker Rebecca Johnson, making her feature directorial debut after a few shorts previously. The film first premiered at the London Film Festival back in 2014, and also played at the SXSW Film Festival in 2015. Ava DuVernay's Array will be releasing Honeytrap in select US theaters starting September 23rd this month. For more info, visit the official site. Anyone interested? A nice big slice of misery.